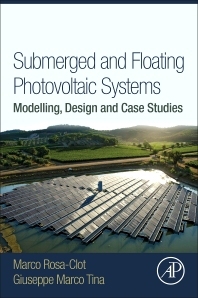 Submerged and Floating Photovoltaic Systems: Modelling, Design and Case Studies investigates how the use of photovoltaic systems in and on the water can create a positive synergy by increasing the cost effectiveness of PV systems, satisfying the local energy demand and creating positive effects on water. Tina and Rosa-Clot combine their wealth of experience to present a theoretical, numerical, experimental and design-focused analysis of water-integrated PV systems. The book is dedicated to providing a very accessible and understandable analysis of the theoretical and modeling aspects of these PV systems. The authors explore and analyze many existing projects and case studies which provide the reader with an understanding of common design and installation problems, as well as a thorough economic study to help the reader justify the adoption of this very clean method of creating renewable energy. Giuseppe Marco Tina is associate Professor of Electric Energy Systems at UdC. In 2013 he received the National Academic Qualification as Full Professor. From 1993 to 1996 he worked in the industrial sector with Agip Refineries and ST Microelectronics in Italy, as electrical engineer responsible for electrical facilities operation and maintenance. He was also made Associate researcher for INFN (National Institute for Nuclear Physics), Catania, Italy in 2002 and was responsible for Erasmus agreements (France, Spain, Greece). Tina’s international scientific output includes 65 journal publications and over 120 publications in conference proceedings. Research and publications: analysis and modelling of renewable energy generation systems (wind and Photovoltaic systems), DGSs (Dispersed Generation Systems), Energy and Ancillary Services Market, Stationary applications of Hydrogen Technology, photovoltaic/thermal (PV/T) systems, monitoring and diagnostic of photovoltaic systems.